Control Resources specializes in custom fan tray design with integrated SmartFan Speed Controls and Alarms. 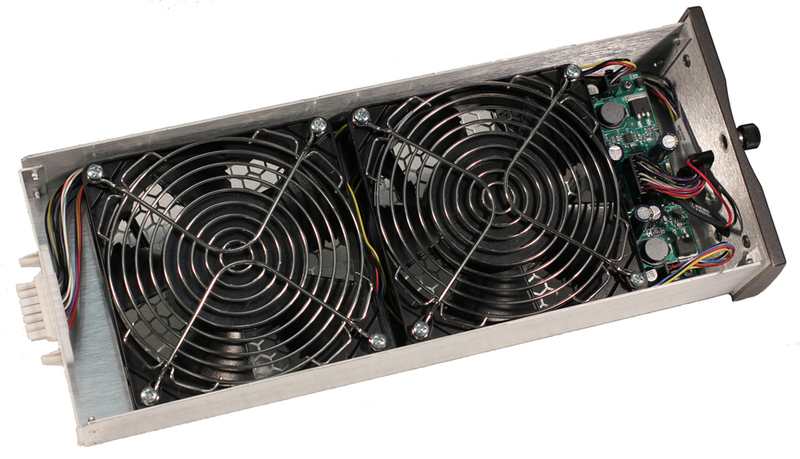 This custom fan tray design features two 24 VDC, 50 Watt fans packaged with a custom SmartFan Multi SD fan speed control and alarm. Power and signal connections are through a Molex BMI connector. The fan speed control board circuitry includes hot-plug capability for fan tray insertion. The painted front panel includes two LEDs powered by the fan speed control board to indicate fan status. A captive thumb screw allows easy fan tray attachment to the chassis. Our experience with telecom fan speed control design optimized this fan tray assembly for maximum performance and reliability. CRI’s ISO 9001:2000 registered electronic design and manufacturing facilities have the capability to provide complete custom fan tray designs from prototype to production fan tray assembly. custom fan tray assembly requirements. Contact our custom fan tray design group today.